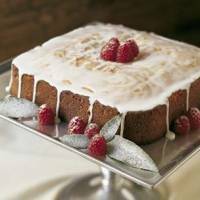 Serve this delicious sour cream coffee cake at your next brunch or afternoon tea. You will receive raves from your guests. Garnishing the cake with fresh raspberries makes a lovely presentation. Preheat an oven to 350°F (180°C). Butter and flour a 9-inch (23cm) square springform pan. In a bowl, combine the 2 tbsp. sugar, the walnuts and cinnamon. In another bowl, combine the flour, baking powder, baking soda and salt; sift the mixture twice and set aside. In the bowl of an electric mixer, beat the butter on medium speed until creamy. Gradually add the 2 cups sugar and beat until light and smooth, 5 to 6 minutes, stopping the mixer occasionally to scrape down the sides of the bowl. Add the eggs a little at a time and continue beating until the mixture is thick, fluffy and double in volume, 4 to 5 minutes. Beat in the sour cream and vanilla, 2 minutes more. Remove the bowl from the mixer and, using a rubber spatula, carefully fold in the flour mixture in 2 additions until smooth. Pour half of the batter into the prepared pan and spread to the edges. Sprinkle the walnut-cinnamon mixture evenly over the batter. Spread the remaining batter over the top, making the sides higher than the center. Bake until the top is set and springs back when touched, and the cake pulls away slightly from the sides of the pan, 55 to 60 minutes. Transfer the pan to a wire rack and let the cake cool in the pan for 1 hour. Remove from the pan and set the cake on a stand or plate. In a bowl, whisk together the milk and confectioners' sugar until smooth. Garnish the cake with the raspberries and drizzle the glaze over the cake. I have just made this tonight. It is delicious. I have never tasted a home made coffee cake before, only the gummy store-bought ones. It has quite a coarse crumb which I should imagine is right for this kind of cake. I baked it for just over 45 minutes as I used one of those heavy cast pans - next time I might even take it out of the oven a few minutes before 45 minutes. The edges are a bit crusty but I think that is a baking time/pan type issue. I would give it 5 stars if it were not for the crust.